A range of tools and resources to support pediatric health professionals working with children, adolescents and mothers with HIV. 1. Why was the Paediatric HIV Resource Library developed? After many years of neglect, global partners are now realizing that the fight against the HIV epidemic must not leave children behind. Ambitious new targets and goals have been set to greatly expand the number of HIV-infected children on antiretroviral treatment, optimize strategies for pediatric HIV case finding and pediatric HIV treatment options, decentralize pediatric HIV care and treatment and integrate pediatric HIV care and treatment into child survival platforms to ensure that no child is missed. IATT Child Survival Working Group has developed the Paediatric Resource Library to provide an online collection of resources and tools for health-care workers, program managers and policy makers in resource-limited settings endorsed by IATT member organizations to accelerate the implementation of high quality, effective HIV Care and Treatment Programs for infants, children and adolescents infected or affected by HIV. 2. Who is the IATT Child Survival Working Group? The IATT Child Survival Working Group (CSWG) sets out to coordinate and facilitate technical, operational and programmatic guidance, share information and learning from technical assistance to priority countries, and facilitate knowledge dissemination for addressing critical gaps in pediatric and adolescent HIV care and treatment. Current group members represent the following organizations: Baylor College of Medicine, Centers for Disease Control and Prevention (CDC), Clinton Health Access Initiative, Catholic Medical Mission Board, Elizabeth Glaser Pediatric AIDS Foundation, FHI 360, FuturesGroup, International AIDS Society, International Center for AIDS Programmes, IntraHealth, Management for Science Health, MSI, Ministry of Health Kenya, Ministry of Health Uganda, Ministry of Health Mozambique, Ministry of Health Zimbabwe, Pediatric AIDS Treatment for Africa, Partnership for Supply Chain Management, Save the Children, UNFPA, UNICEF, UNAIDS, USAID, World Food Programme, World Health Organization, and World Vision. 3. How is the Paediatric Resource Library organized? The Paediatric Resource Library is organized by along the continuum of care. Tools related to policy-making, supply chain and costing, training, mentoring and supervision, clinical care are also included. 4. Who is the audience for the library? The Paediatric Resource Library contains a variety of tools and resources aimed at multiple audiences and stakeholders, including health care workers, programme managers and policymakers in resource limited settings. The Paediatric ARV Cost Comparator Tool (2016) is designed to optimize paediatric ARVs by analysing the cost differences among various drug regimens. It is a helpful tool to use prior to a planned procurement order cycle. 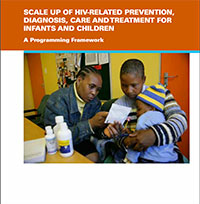 The Paediatric Programming Framework (2008) assists national health managers and implementing partners in settings with limited resources to scale up HIV prevention, diagnosis, care and treatment for children. This framework is guided by evidence and lessons learned from scaling up HIV initiatives in settings with limited resources. It discusses seven key strategies which can be used to scale up national HIV programmes. In 2011, the Interagency Task Team (IATT) for Children and HIV/AIDS developed the Pediatric HIV Advocacy Toolkit to improve HIV diagnosis, care and treatment among children living in areas with a high HIV prevalence. This toolkit facilitates a commitment among Ministries of Health, policymakers, and partners to prioritize paediatric HIV treatment and take action to improve the access to and quality of paediatric HIV treatment coverage. The supplemental presentation can provide additional information and guidance. The Double Dividend Framework was developed to catalyse action to: (1) end paediatric HIV and AIDS, and (2) improve child survival. It highlights current gaps in paediatric HIV treatment and proposes strategies to reach the two aforementioned goals. 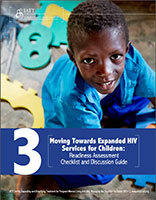 Moving Towards Expanded HIV Services for Children: Readiness Assessment Checklist and Discussion Guide (2012) is intended to be used to assess the readiness of the health system to improve care and treatment for children infected and affected by HIV. It is a checklist for national and sub-national policymakers and programmatic leaders to facilitate the review the steps needed to improve infant diagnosis and increase treatment coverage for HIV-infected infants and children. It may be used in the context of paediatric ART decentralization, to address gaps in paediatric HIV testing, care and treatment and/or when adapting the 2015 WHO Consolidated ARV Guidelines. The checklist is organized into the following sections: political commitment and policy endorsement/roll-out strategy/ financial planning/service delivery models; human resource capacity; monitoring, evaluation and data use; site supervision and quality management; laboratory and clinical monitoring; antiretroviral regimen choice; supply chain management; identification and HIV testing for HIV-exposed infants; counselling on diagnosis, ART initiation and adherence; infant, child and adolescent diagnosis and treatment; retention in care and treatment; and family referrals and community involvement. 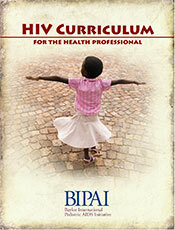 The Baylor College of Medicine International Pediatric AIDS Initiative (BIPAI) created a fourth edition of the HIV curriculum for the Health Professional in 2010. This curriculum is designed to help health professionals improve the care they provide to their patients living with HIV. In 2012, ICAP developed a comprehensive Adolescent HIV Care and Treatment: A Training Curriculum for Health Workers to provide health care workers with a tool to deliver clinical and psychosocial services to adolescents living with HIV infection. This training empowers multidisciplinary health workers to have the confidence and skills to deliver comprehensive, youth-friendly HIV services that support adolescents' healthy development, psychosocial well being, retention, adherence, sexual and reproductive health, and eventual transition to adult HIV services. This document developed in 2013 provides specific recommendations for national policy-makers and programme managers and their partners and stakeholders on prioritizing, planning and providing HIV testing, counselling, treatment and care services for adolescents. They include an interactive web based tool which provides practical guidance and multi-format resources for reaching adolescents. The tool also covers operational considerations by providing concrete, practical examples of service delivery approaches that have been successful and practical tools that have been useful for some programmes. This tool helps health care facilities determine their readiness and ability to provide paediatric HIV care. 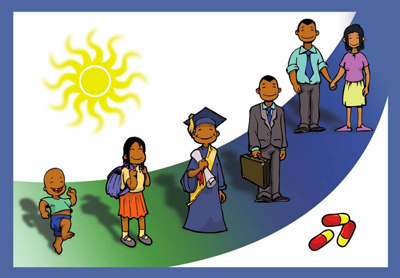 In 2015, the Paediatric AIDS Treatment for Africa (PATA) and One to One Children's Fund created the Community Health Worker and Peer Supporter Toolkit to help community health workers and peer supporters be more effective in working with children and adolescents living with HIV throughout sub-Saharan Africa. This self-study guide teaches these workers how to improve their delivery of psychosocial support, treatment and care, and community outreach for youth living with HIV. This tool was developed by the Centers for Disease Control and Prevention in 2009 in response to the need for standardized guidance for early infant diagnosis (EID) of HIV. This series of guide books help program managers, clinical staff, and laboratorians to assist in EID. This tool, developed by the World Health Organization (WHO), is based on the content of the 2013 Guidance for Testing and Counseling and Care for Adolescents Living with HIV. It illustrates, animates, and amplifies the recommendations from these guidelines by providing practical guidance and engaging resources for reaching adolescents and delivering more appropriate HIV testing and counseling, treatment and care services for adolescents. Strategies for Identifying and Linking HIV-Infected Infants, Children, and Adolescents to HIV Care and Treatment (2014) is a guidance document for health care workers and programme managers that outlines strategies for identification of HIV infected infants, children and adolescents and linking them to care and treatment. It explains the rationale for testing in various settings as well as lists operational considerations for programmes to consider. The IATT CSWG would like to note that since finalization of this document, additional two issues have emerged related to paediatric HIV case finding. The introduction of birth testing for HIV may be considered by some programmes as anaddition to routine testing of HIV exposed infants at 4-6 weeks. Newly reviewed evidence on the use of serologic testing in infants indicates that rapid diagnostic tests for HIV serology may be used to identify HIV exposure in infants less than 4 months of age, but between 4-18 months, HIV exposure status is more reliably identified by rapid serologic testing in the mother. This toolkit developed by AIDSTAR-One and published in 2014 is a guide and training manual for health care workers and community care providers in the care of adolescents living with HIV, including developing skills in self-management, in particular during the transition from adolescence to adulthood. It primarily targets healthcare providers and community care providers, but also families, caregivers, and the adolescents themselves. It includes modules with specific tools for clinical management and community management, checklists, and other guidance documents. The CHAI Dosing Wheel is a tool intended for use by HCW's to support prescription of appropriate dosing of commonly used ARV's according to WHO weight bands. The current tool posted consists of 3 pages that may be assembled into a wheel. Cut around the blue border of each circle. Position the circle from page 3 behind page 1 and 2 facing outwards (optional). Place a single fastener through the green circle to fasten the pages together while allowing for movement of the top circle. Identify the drug formulations being prescribed for the patient. Turn the wheel so that the grey arrow falls directly below the desired weight band. Find the corresponding dosing within the rectangular window. The IATT CSWG would like to note that the current CHAI dosing wheel was completed prior to the development of the 2013 WHO Consolidated Guidelines and as a result may contain information on drugs no longer recommended for use including d4T and ddI containing formulations. Additionally a new dosage form of ABC/3TC 120mg/60mg scored dispersible tablet is now available but not included in this version of the wheel. The back of the wheel also includes guidance on prior recommendations to initiate all children < 5 years which may not be in line with current national guidelines therefore use of the 3rd page of the wheel is optional. A new wheel is now in development in line with 2016 WHO guidance and current practices and will be available at the end of 2016. However, for programmes interested in procuring preassembled versions of this dosing wheel or interested in adapting the wheel according to national guidance, please contact bstewart@clintonhealthaccess.org. The Update to the Optimal List of Paediatric ARV Formulations (2016) has been developed by the IATT in response to procurement and supply challenges resulting from fragmented demand for paediatric ARVs, and has been developing guidance around the selection of optimal products since 2011. It is intended for use by programme managers and policy makers and provides formulary selection and procurement guidance for the optimal paediatric ARV dosage forms needed to provide all WHO recommended 1st and 2nd line regimens while simplifying supply chain and easing administration. The brief includes both the Optimal Paediatric ARV formulary as well as the Limited Use list of those formulations that may be needed in special circumstances. As the Optimal Formulary and Limited Use lists are updated on a regular basis, explanation is provided for updates made since 2013. A 2016 version is expected shortly. 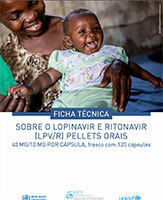 LPV/r pellet procurement brief (IATT Child Survival Working Group) The policy brief Supply Planning for New Dosage Form of lopinavir and ritonavir (LPV/r) oral pellets (2015) is primarily intended for programme and supply chain managers and provides guidance and consideration of key points before and during the introduction of the new LPV/r oral pellets at the national programme level. It is also available in French and Portuguese. The fact sheet on lopinavir and ritonavir (LPV/r) oral pellets (2015) provides simplified information for health care workers to facilitate proper dosing and administration of a new formulation of heat-stable LPV/r oral pellets. It includes the WHO weight band dosing schedule for the LPV/r oral pellets as well as instructions for administering the pellets to infants and young children older than 6 months who are able to take soft food as well as for infants under 6 months who are exclusively breastfeeding or formula feeding. It is also available in French and Portuguese. Simple tool for quantification of adult and paediatric antiretrovirals (updated 2016) is morbidity based forecasting tool intended for use by programme managers to quantify ARV needs and may be used planning at facility, regional or national levels. The Simple Tool is Excel-based and programme inputs are entered to complete a forecast for 2 or 3 year period. A user manual is also included which reviews basic principles of quantification and methods of forecasting as well as step-by-step instructions for use of the tool. 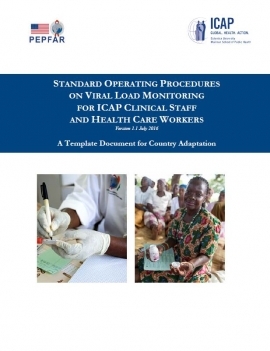 Standard Operating Procedures on Viral Load Monitoring for ICAP Clinical Staff and Health care workers is a template document that may be adapted at the country level and used by HCW's as a tool to assist in the use of viral load monitoring. It includes sections on principles of using viral load monitoring, schedules for routine viral load monitoring, interpretation of results, patient management and specimen handling. This document is currently being updated to reflect the 2015 WHO Consolidated Guidelines for Prevention and Treatment of HIV, and the tool will be updated as soon as that is available. This toolkit is primarily intended for use by health care workers to support pediatric HIV disclosure. It has four components: a readiness assessment tool, a children's picture book, a disclosure form and a paediatric disclosure register. The Assessment of Family and Child Readiness for full HIV disclosure Form may be completed by the health care worker during the interview with the family prior to initiation of the disclosure process to identify barriers, assess the child’s readiness for disclosure, and discuss preferences for disclosure method. The picture book Why I take my medicines (2012) is intended to be used a visual tool to share with patients and families. It includes child-friendly images to explain HIV infection and ART with an emphasis on adherence. The book also includes instructions and prompts to support HCW's in explaining the concepts in the book. The Paediatric Disclosure Register allows facilities to document the progression of all paediatric patients that have gone through the disclosure progress. 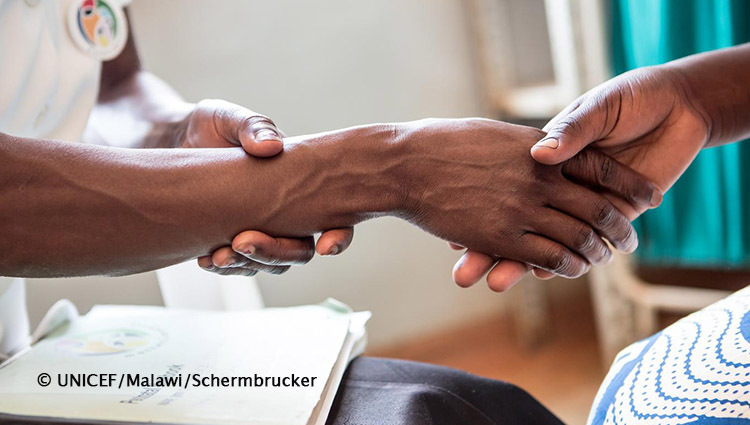 The OI and Skin tool to aid in diagnosis of HIV/AIDS skin conditions (2015) is an atlas designed to support health care workers in the diagnosis of dermatologic manifestations of common conditions in HIV-infected patients. It includes basic guidance on determining the morphology of a dermatologic lesion as well as diagnostic tables including photographic representation of specific skin conditions.